Never a more generous man have I met than poet and friend, Matthew Rotando. 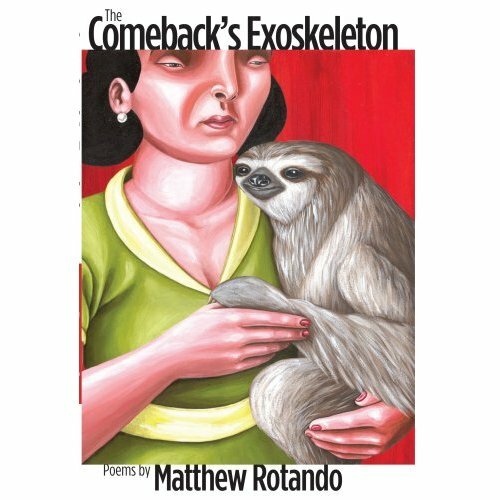 I take great pleasure in singing the praises of his first book of poems, THE COMEBACK’S EXOSKELETON. I wish you could all know him too, as you will find that once you fall in love with this collection, you will long to meet the person who has such zest for life as well as an eye not afraid to behold our evils. It’s really a lovely collection — and I’m not just saying that because I’ve been waiting for years for it to appear. You should throw caution to the wind and take up this EXOSKELETON! Discover how well dresses up your own worldview! Son, watch the way the eaves bend when you breathe. If you could corral water into spheres. They will hold your cages and laboratory equipment. Regarding prostrations and guttural pronouncements. Bring back an “I ♥ Mt. Rushmore” keychain for your mother. Is really the mold oviestar, Lon Chaney. That they’re both obvious dasters of misguise. sticky round fingers. A friend is someone who decides to find you out. In the mood for one more? Try this one, complete with a nearly naked pic!